Life With 4 Boys: Put Your Family in a Tech Timeout! Put Your Family in a Tech Timeout! This post is brought to you in collaboration with Foresters™ and Tech Timeout™. Obviously, I am a huge supporter of quality family time. In fact, it is the main reason why I packed up the van this summer and took the boys out on a 50 day camping adventure. The bottom line is, your children only have so long to be kids, and you as a parent only have so long to connect with them and enjoy that before they go into the world as adults on their own. I don't want to miss a second of this time together. That is why, I am also a huge supporter of Foresters' Tech Timeout Challenge! 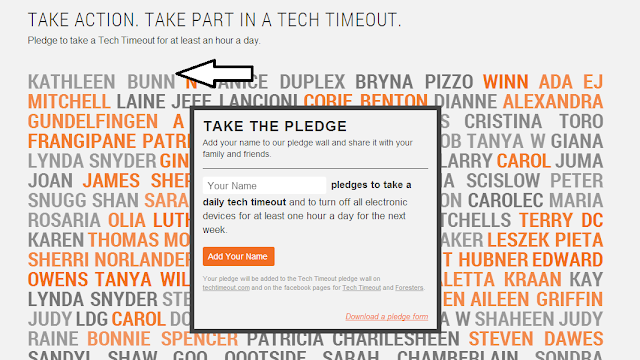 Basically, the Tech Timeout Challenge is a timeout for adults and children alike from all forms of electronics. I am basically attached to my computer for the majority of the morning and afternoon. Sometimes I will get so involved in what I am doing that I won't even remember what one of the kids just said. Why? Because it is so easy to zone out and ignore everyone when you are entranced with electronics. The boys do the same thing if they are into a TV show, movie or video game. A Tech Timeout allows you to take a break from electronics and reconnect with each other. See the comical side of what can happen when you are distracted by electronics in this funny video from Foresters. Life insurance provider Foresters is always looking for ways to help families spend quality time together, so they developed Tech Timeout. 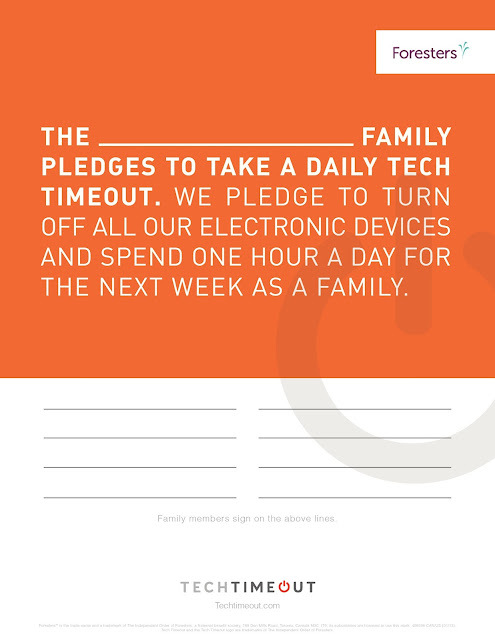 When you take the Tech Timeout pledge, you and your family are agreeing to put away all forms of electronics for one hour each day for a week in order to spend time reconnecting. Basically, you disconnect to reconnect with each other. What do you do for an hour without electronics? Check out this great list of ideas! One of our favorite things is getting outside and exploring our local parks. Want to reconnect and put your family in a Tech Timeout? It is simple to do. Just visit the Tech Timeout site and you can take the pledge. I took it, see my name right there on the digital pledge wall? After you take the pledge, you can print out a paper pledge that your whole family can sign. You can put this on the wall or fridge as a reminder that each day for that week you need to unplug from all electronics and reconnect with each other in a fun way! You can also visit the Tech Timeout Facebook page after your done to share your story and experience. 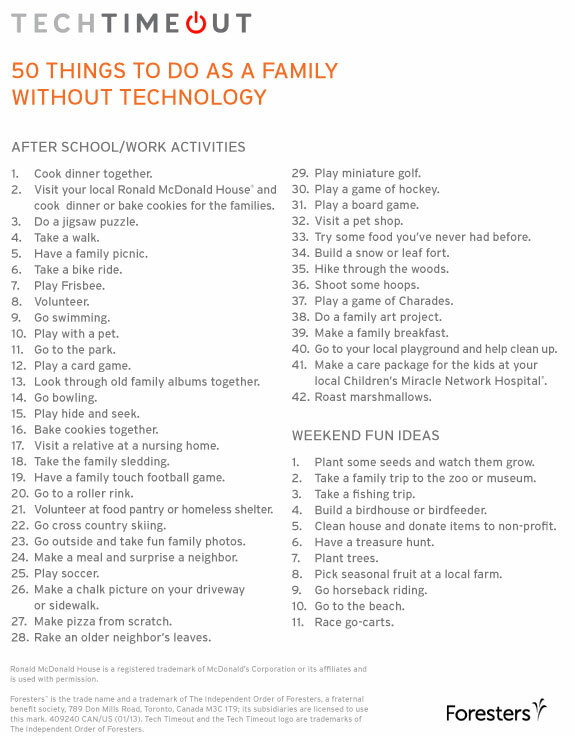 Or, stop by the Tech Timeout Pinterest page for more ideas on how you can have fun reconnecting as a family. If you take the Tech Timeout pledge and reconnect with your family, I would love to hear how your week went and what fun things you were able to do with your family during that time! This is a sponsored post with Foresters, but all words, thoughts and opinions are my own. That's a great list of things! Today we stepped away from the tech and went to the library. My kids definitely need a tech timeout!! OUr family needs to do this. I just saw this list on another blog. I love it because sometimes I just draw a blank on things we could be doing.